Lindros2 - If the dealer is baiting you with an 'intelligent cruise control' recall, and your Maxima version does not have intelligent cruise control, he is either misguided or abusing the system. But just to be sure you don't have any trouble, I wanted to confirm that you were aware (as I think you said you are are), that ALL versions of the 8th gen Maxima have ABS systems by government requirement, and some of those ABS systems were installed with faulty pump seals, allowing fluid to leak out onto a hot surface, starting fires. Only your service tech can read the pump serial and determine if your pump is on the pump recall list. You might should call your dealer and tell them you received a recall notice for intelligent cruise control, which your car does not have. He may have confused two different recalls. The fact this is the SECOND recall for the ABS pump seals further confuses the problem. It’s not me bro. READ ABOVE. And do they all have ABS? I got the card in the mail from the dealer and nothing from Nissan corporate at this point. It only mentions a "possible SAFETY RECALL" and nothing specific. That's why I was posting here to see if a new issue popped up since my VIN was clean when I looked it up for recalls. And FWIW, the possibility that this was ABS-related was pure speculation on my part. This isn't good. 7 recalls, and two safety concerns re: FUEL LEAK after an accident. Just go to NHTSA.gov, people. When I entered my VIN, it answered all of my questions (and highlighted spelling errors for giggles). IN CERTAIN VEHICLES AFFECTED BY THIS RECALL, THE ANTI-LOCK BRAKE SYSTEM (ABS) ACTUATOR MAY LEAK BRAKE FLUID. IF THIS OCCURS, THE ABS WARNING LAMP WILL ILLUMINATE AND REMAIN CONTINUALLY ILLUMINATED ON THE INSTRUMENT PANEL. IF THIS CONDITION IS IGNORED, THE LEAK CAN POTENTIALLY CREATE AN ELECTRICAL SHORT, AND IN RARE INSTANCES, MAY LEAD TO A FIRE. YOU MAY HAVE RECIEVED PRIOR NOTIFICATION TO BRING YOUR VEHICLE INTO THE DEALER FOR REPAIR. IF YOU RECEIVED PRIOR NOTICE, OR HAVE NOT, PLEASE BRING YOUR VEHICLE INTO A NISSNA DEALER FOR INSPECTION IN EITHER CASE. YOUR NISSAN DEALER WILL INSPECT THE SERIAL NUMBER OF THE ABS ACTUATOR, AND IF IT IS WITHIN THE AFFECTED RANGE, THE DEALER WILL REPLACE THE ABS ACTUATOR WITH A NEW ABS ACTUATOR AT NO COST. please contact the NHTSA Vehicle Safety Hotline at: 1-888-327-4236 or TTY: 1-800-424-9153 or file an online complaint with NHTSA. Well the Dealer is holding my car hostage until the recall part comes in. I'm stuck driving an Altima loaner. I don't think they physically checked anything, I was in for something else when he said the car had some sort of code that indicated the pump needed replacing and they would give me a loaner. ABS lite does not say on - only blinks on startup. Has anyone had there car up in flames? then you’re fine, and your dealer is a crook. I think crook is a little strong since the postcard said it was a "possible" safety recall and they would at least be giving me a free oil change. I've dealt with plenty of sleazy dealers over the years and these guys haven't been too bad (I realize that's not saying much). Their parent company has been gobbling up several local Nissan dealerships though, so the good pricing I got when I bought my car may go bye bye if they control more of the local market. Using a recall to “bait” people to come in is against Federal Trade Commission law. This is why there are online VIN lookups - otherwise every “possibly affected” Maxima would need a clean bill of health before being sold as used (dealers can’t have it both ways - are they inspecting every new and used car on the lot? Absolutely not). Recall work is a huge profit center. As is... doubling the money factor on leases (see: Nalley Nissan / Asbury Automotive). Slime bags. Using a recall to “bait” people to come in is against Federal Trade Commission law. Huh, I have not heard that before. Do you have a source you could link to? Seriously, why would I make this up? Attorney, Division of Consumer & Business Education, FTCA recall notice for your car or truck signals a serious safety defect that you should try to get fixed quickly. 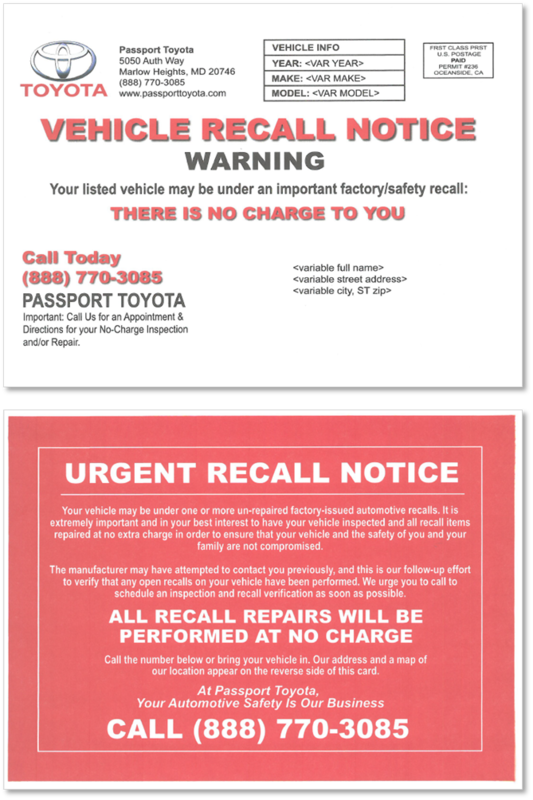 According to an FTC lawsuit, a group of auto dealerships counted on people doing just that when they sent fake mailers marked “URGENT RECALL NOTICE” to more than 21,000 vehicle owners, most of whom did not have recalls. In the words of one defendant, the mailers were designed to “drive some traffic” to the dealerships’ service departments. According to the FTC, many people who got the notices called the dealerships t o find out their vehicle’s actual recall status. Many who called were told they had to bring their vehicles to the service departments to learn their vehicle’s status and, the FTC said, a lot of them did. Mines, done! New "actuator" (ABS Pump) installed. About one day faster that what was predicted here for the part to come in. Thanks, lindros2. Good reference. I may have misread it, because it seemed the guilty dealerships got little more than a slap on the wrist. There should have been significant fines for such greed and dishonesty with public safety involved. The worst thing is that such antics both confuse an important issue and set up customers for work that may not be tied to safety, or may not actually be needed at all. This type dishonesty also adds to the ongoing problem of busy folks that just don't feel they have the time to take off work and take their car to the dealer for a recall they don't quite understand. The longer those folks 'get away' with not acting on recall notices, the more apt they are to ignore them in the future, possibly to their great peril. Oh wait there are about 50 other stories about that, too... Too tired to post/search, but you can do it. I received this notice today for my 2017 Max SL: Nissan records indicate that your vehicle is subject to a safety recall. Nissan is currently preparing parts to remedy your vehicle. In the meantime, Nissan is asking you to follow the following precautions. In some vehicles affected by this recall, the Anti-lock Brake System (ABS) actuator may leak brake fluid. If this occurs, the ABS warning lamp will illuminate and remain continually illuminated on the instrument panel. However, if this condition is ignored, the leak can potentially create an electrical short, and in rare instances, may lead to a fire. Anti-lock Braking System (ABS) warning lightIf your ABS warning lamp is continually illuminated and you require alternative transportation while your vehicle is being remedied, your Nissan dealer will make appropriate arrangements at no cost to you. In the coming weeks, you will also receive a recall notification letter with further instructions. Until then, if you have questions regarding the safety recall, please visit www.nissan-usa.com/recalls-vin#/ or contact Nissan Consumer Affairs at (800) 867-7669. Nissan is committed to the safety and security of our customers and their passengers. We are indeed sorry for any inconvenience this may cause you. I phoned Nissan consumer affairs in Canada to inquire about the ABS pump recall and was informed that my vehicle has been recalled. Called my dealer which is two hours away to arrange for the recall while other warranty work is being performed. They said that they have to check the pump to see if it is part of the batch that could potentially leak. Unfortunately, Nisan Canada will not allow the dealership to have the required replacement parts on hand should this happen, as they would then need to order them. And if it is deemed to need replacement they can't release my vehicle until it is repaired. Not a big deal if I lived locally, but I don't. This would require me to return at a later date. Going to contact consumer affairs tomorrow and ask WTF. Just as info, U.S. dealers are in the same situation. Not allowed to stock the part. If your pump serial is on the recall list, they cannot let you drive the car. My dealer is an hour away, so they paid for me to rent an SR Maxima for the week or two while they waited for the replacement pump. So the only question in my mind is why are dealers not allowed to stock a replacement part which, if it goes bad, the car cannot be driven? I'm sure there is a reason, but it escapes me. Ditto to all of these. Replacement parts = could be a supply issue, or just a logistics issue, or something else. I took my car to the dealer this morning. They said they inspected the car per the recall notice but determined that nothing was wrong and that nothing needed repair or replacement. Does this sound correct? Should they have replaced the parts no matter what? I’m confused so thanks for any thoughts. Last edited by Gator5000e; 10-17-2018 at 10:00 AM. 1. Your VIN was flagged as "part of the campaign" (due to configuration/features/options). 2. However, dealers have to actually inspect the SERIAL NUMBER of the part (ABS actuator). 3. Yours is okay; nothing wrong. Great. Thanks so much for the explanation!! 240tomax, my dealer gave me a free loaner while waiting for the parts, you should check but its likely that they have to give you a free loaner, as they they can't just keep your car with out compensation. They are providing a loaner (actually overall this dealer is awesome)...but I don't want to have to go home and then come back a couple days later with a round trip of over 4 hours each time. 240tomax - It is tough that you live so far from your dealer. I had that situation when I lived in the southern Arizona desert back in the 1950s (not driving Nissans at that time, of course), and it was not fun. I now live less than an hour from four Nissan dealers, and less than two hours from nine or ten Nissan dealers. This is nice when I am ready to buy a new Maxima, because I can keep up with the inventory for all those dealers, and if exactly the Maxima I am looking for appears in the inventory of any one of those dealers, I simply call my local dealer and make an offer on the car I want, and if he accepts, he has the car transported to his lot and preps the car for me. I purchased my last two Maximas that way. You should not be faced with this situation. Nissan should allow dealerships to stock any part without which the car is not to be driven. That strange situation resulted in my being able to drive a new SR for two weeks at Nissan's expense, but if I was not retired, I would have not been happy with that time-consuming situation. I just came off a three day over 1,000 mile trip Monday, had my 2016 Platinum detailed Tuesday morning, and took it to my dealer for oil change, air filter, cabin filter, tire rotation, etc on Tuesday afternoon. When my car was ready for pickup, the lead mechanic (whom I have known over twenty years at two dealer locations) was waiting with my writeup tech and service manager and told us he had checked the serial number on my ABS pump and my car did not need a new ABS pump. I was relived, because, had the pump needed to be replaced, they said it would have taken them three days to get the new pump in hand, and I would have had to rent a car (at their expense) just as I did last year during the first version of this recall. While waiting during the servicing of my car, the owner of my dealership (he now owns four Nissan dealerships, a Kia dealership, and a Toyota dealership) showed us a loaded Lexus LC 500 he was selling at an excellent price. My wife and I loved the interior and the side appearance, and the view from behind was very impressive. But not the front grille. The car was in immaculate condition. The dealership owner had driven the car for one year. His MSRP was just over $99K, and he was letting it go for $84.9K. It was very tempting, but we could not get past the front grille, and that kind of money would buy each of us a loaded Maxima Platinum with change left over, so we did not bite. Someone will get that really impressive car at a good price. But the LC 500 is not really me. I'm a Levis guy, not an Armani gentleman. I'm much too frugal (and cheap) to be seen in that luxurious car. Ahh yes, sensibility prevails! I am thinking the same way. I just hate having that much dough sitting out in the parking lot. The LC500 is a great car but Toyota needs some styling help with the front end of their cars.